PHOTO BY JIMMY FLINT Seneca County Commissioner Shayne Thomas speaks during a legislative breakfast Monday morning at Camden Falls Reception and Conference Center. Federal, state, county and city officials addressed local business leaders on progress made last year and previewed 2018 during a legislative breakfast event at Camden Falls Reception and Conference Center Monday morning. The event, hosted by Seneca Regional Chamber of Commerce and Visitor Services, offered local leaders updates on the state of the 4th Congressional District, the 88th Ohio House District, Seneca County and the city of Tiffin. U.S. Rep. Jim Jordan, R-Urbana, discussed the federal budget, which he said likely will be voted on this week. He said he thought 2017 was a good year. 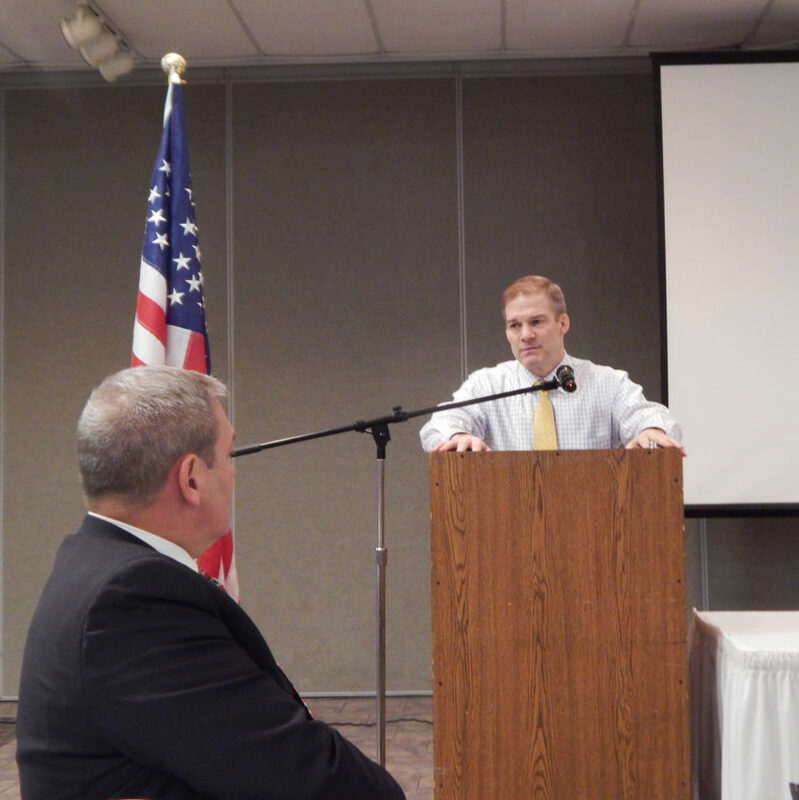 PHOTO BY JIMMY FLINT U.S. 4th District Congressman Jim Jordan (right), R-Urbana, addresses local leaders at a legislative breakfast Monday morning as Seneca County Commissioner Shayne Thomas looks on. Jordan said there is work to be done this year, including passing reforms to welfare programs that incentivize working. He said able-bodied people should have to do something to earn welfare from the government. “(Reform would be) good for taxpayers, good for the overall budget and most of all, for people themselves to better their situations,” he said. Jordan said he believes the economy is heading in the right direction after tax cuts were approved at the end of last year. He said one example of this was Roppe Corp., a Fostoria company, giving $1,000 bonus checks to employees. He said for the past eight to 10 years, the economy was growing at a rate of 1 percent to 1.5 percent, but now it is growing at about 3 percent. Jordan and state Rep. Bill Reineke, R-Tiffin, who represents all of Sandusky and most of Seneca County, both mentioned developing a workforce for jobs that need to be filled as a big challenge. Reineke said developing the workforce could be one of the most important issues Ohio faces. He said by some measures, 1,500-2,000 jobs may need filled this year in his district. “The more significant piece, five to 10 years from now, we’re not identifying what kinds of jobs those are because of changes to technology,” he said. Reineke said leaders in government, education and economic development are working together to create standards for students that will help them fit the workforce needs. One example is a shift in learning critical thinking, so people can adjust to a workforce that changes quickly due to technology. He said projects such as the Fostoria Learning Center are an example that the focus isn’t just on youths. “It is more designed for lifetime learning because our jobs are changing,” he said. Reineke said he is proud of the steps being put in place locally to prepare for this landscape. Reineke also mentioned energy as a big issue. “Our best resource here is wind, and it’s not just me and Jim (Jordan),” he joked. Seneca County Commissioner Shayne Thomas said potential wind turbine projects in the county could result in about $800 million in investment. He said this could be the most significant investment the county has seen. “Our county is the epicenter of the discussion on wind in Ohio,” he said. Thomas said 2017 was a year of collaboration for the county. 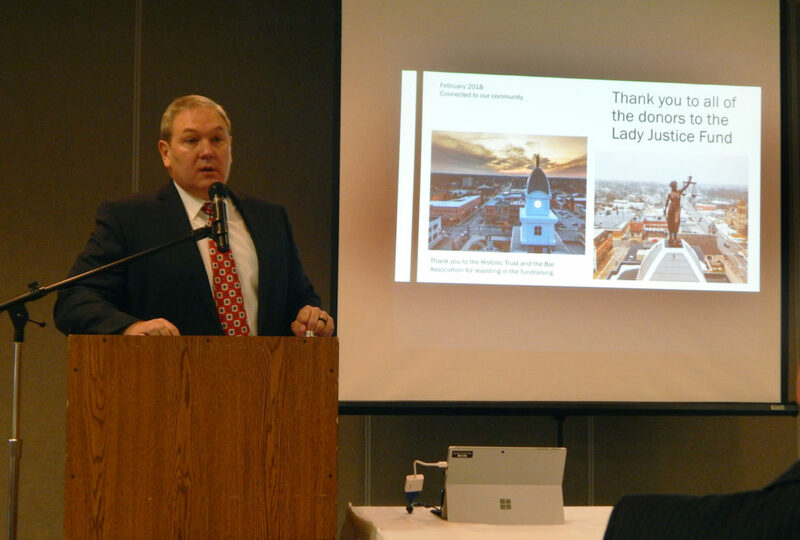 He touted the construction of Seneca County Justice Center, renovation and relocation of Seneca County Board of Elections and Seneca Regional Planning Commission as large projects. He also said the former commissioners’ office building, 81 Jefferson St., was donated to the East Green park project. Thomas said 2018 will be a big year for planning, including unveiling of a countywide branding initiative, an active transportation plan, a joint comprehensive plan, a bus route plan and a long-term downtown parking study. Tiffin Mayor Aaron Montz said several businesses held ribbon-cuttings in 2017, including Benchwarmers, Tim Hortons, Washington Street Outfitters, Tiffin Pointe, the Renaissance of Tiffin, Smith Family Frosted Foods, Ironwood Steakhouse and Jolly’s at its new downtown location. He said many businesses also expanded, including American Fine Sinter. Montz said city government had several projects, including rebuilding of the Rebecca Street bridge, which was dedicated and renamed the Bernard J. Hohman Bridge, in honor of a former mayor. He said several paving projects were completed, including work on North Washington and West Market streets. He also said Tiffin Fire Rescue Division purchased a $1.3 million ladder truck, which was 95 percent funded by federal grant money. In 2018, Montz said many projects are planned, including renovation of Sarah Street, an upgrade of streetscapes on Market and Perry streets and the summer opening of East Green park and performance pavilion. Montz also mentioned the west end development, a 60-acre plot of land across from Mercy Health – Tiffin Hospital that is to serve as a commercial and retail park for the city. He said things are going well, but stressed the need for city voters to approve a five-year, 0.25 percent income tax levy to pay for road and bridge maintenance. Montz said without grants, the city spends about $450,000 annually on streets and bridges, but he said it is recommended the city spend about $1.2 million to stay caught up with maintenance. If the levy is approved, the city would spend about $1.5 million annually and roads that would have been repaired only once every 40 years could be fixed once every 10-12 years. “Give us five years, if we can’t wow you with what we can do with that money in five years, you’ll have the opportunity to vote again,” he said.